Sandy Dyre has built a collaborative 9-1-1 data sharing community across Arizona. This includes sharing data (roads, address points, and emergency service boundaries) and sharing best practices related to the creation and maintenance of these data sets. Sandy also leads the development and publishing of best practices and standards. The improved public safety data that results means better emergency response which benefits the entire nation. When the Agency for State Technology strategic planning group surveyed state agencies to find "golden threads" for opportunities for improvements in state government, statewide GIS coordination was identified as just such an opportunity. After being assigned the task, Strategic Planning Coordinators Kayren McIntyre and Eric Steinkuehler threw themselves into the effort of convening and sustaining an enterprise GIS workgroup. After two years under their leadership and championship, the workgroup made significant progress creating a statewide GIS open data portal, the state's first GIS resources and information page, and presented a business case and justification, which has lead to the creation of a geographic information office within the Agency for State Technology. At the end of a contentious battle over the state's budget and a shutdown of state government, funding for the Maine Office of GIS (MeGIS) was eliminated. Jon Giles, Chair of the Maine GeoLibrary, led a statewide campaign to support reinstatement of funding for the MeGIS, which provides staff support for the Maine GeoLibrary and its programs. Under his leadership, GeoLibrary Board informed the state's GIS community to this issue, which resulted in an outpouring of calls, emails, and letters to the Governor's office and legislative leaders to emphasizing the public's need for geospatial data and the services that MeGIS and the GeoLibrary provides. The Governor has requested the legislature convene an emergency session to address the MeGIS funding issue and one other issue of statewide importance. Meetings with senior legislative leaders indicate that funding will be restored and the office will continue with its original budget request granted. Sharon Hawkins is a geospatial champion who embodies all the criteria for this prestigious award. 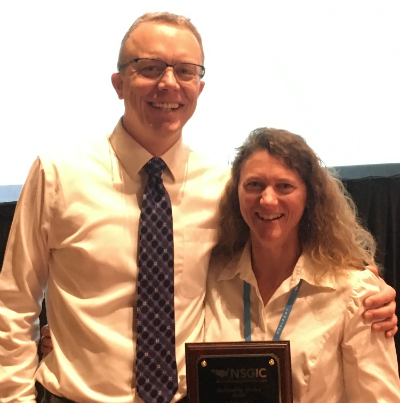 As the Section Head for GIS and Mapping at the Arkansas Department of Transportation, she recognized and championed the goal of having a single statewide road centerline. Her goal was to eliminate the need for silos of redundant data sets stored in multiple locations across the DOT enterprise. Additionally, Sharon serves the broader geospatial community both in Arkansas and nationally as Vice Chair of the Arkansas GIS Board, as a member of the Arkansas GIS Users Forum Executive Committee, and as Region II representative on the GIS-T Task Force. She has been vocal in numerous forums about best practices and benefits of creating one transportation data set and using many times over. The staff in Esri's Honolulu office - Daris Hao, Craig Clouet, and Rod Low - has regularly gone above and beyond its contractual obligations and partnered with the Hawaii Statewide GIS Program to help grow GIS capacity within the state government. Thanks largely to their efforts at forstering non-traditional users and offices (such as the governor's office and the legislature), there has been a five-fold increase in online users in the last three years and a steady increase in the quality and quantity of web maps and story maps. In 2013, the Kansas 911 Coordinating Council embarked on an effort to modernize the state's 911 call handling system and position the state for migration to a Next Generation 911/i3 architecture. An integral part of this effort was the development (and ongoing maintenance) of the statewide geographic data that will fuel the routing engine of the new system. Through the council's vision and leadership, statewide, strategic, and authoritative data have been created to support the NG9-1-1 initiative and leveraged by state and local jurisdictions for many other purposes. The Kansas NG9-1-1 program has had a huge impact on the state's GIS initiative. Key team members are: Scott Ekberg, Eileen Battles, and Sherry Massey from the Kansas 911 Coordinating Council; and Kristen Jordan-Koenig and Kelly Emmons with the from the Kansas Data Access & Support Center. James Meyer has built a collaborative data sharing community in Arizona for the generation and maintenance of road centerline files. This work aggregates the data from disparate source files and shares the products for authoritative community-based update and editing. James has also championed the development of lifecycle supply-chain best practices, and promotes Arizona data and methodologies in-state and nationally. The Wisconsin Department of Natural Resources -- led by the efforts of Lisa Morrison, DNR GIS Section Chief, and Nina Rihn, DNR GIS Data Specialist --- has launched a new web portal that provides NDR staff and the public the ability to search for, explore, and download DNR-managed geographic information system data. The DNR open data portal is a streamlined and easy-to-use platform that allows users to search for data by keyword or general category. Users then have a number of options to view information in spatial or tabular forms, download it, or add the data to an online GIS map. Utah's Governor's Office of Economic Development, through its Broadband Outreach Center and Office of Outdoor Recreation, has championed the use of GIS and enterprise mapping initiatives to deliver value to Utah citizens and businesses. Projects include residential broadband mapping, commercial broadband availability, trail and recreational amenities GIS data layers, partner funding for high resolution aerial photography, and locate.utah.gov - Utah's award-winning state economic development interactive map. Kelleigh Cole, Director of GOED's broadband center, has been an active, supporting, and connecting partner to Utah GIS for the past 6+ years. 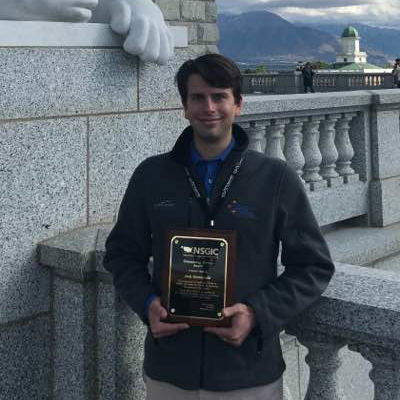 The Utah Land Information Records Workgroup, a multi-agency partnership of state and local government was formed and facilitated by Evan Curtis, the State Planning Coordinator in the Governor's Office. Over several months, the group defined a best practice for the voluntary sharing of annual, detailed tax parcel data. This included conceptual recommendations and content guidance in the form of a data model. In its first year, 20 of 29 Utah counties contributed to this open, statewide GIS data layer that is used to support economic development, public safety, planning, and other important application areas. Rodney Bennett, 2016 Chair of the Utah Assessors Association, and Ted Knowlton, Deputy Director of Wasatch Front Regional Council, provided instrumental facilitation to the discussions that formed Utah's approach to sharing this valued information. Bill Johnson exemplifies, at the highest levels, the founding hopes and ideals that led to NSGIC's founding in 1991 up to why we all traveled to Rhode Island for the recent annual conference. His 31 years of state government service tracked from a level 1 map technologist at NYDOT up to over 15 years as state GIO impacting framework data programs on imagery, addresses, transportation, and broadband, to name a few. 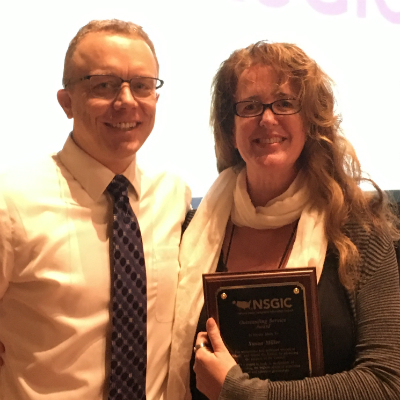 And, along the way, many in NSGIC have greatly benefited from his insightful advocacy, mentoring, and direct leadership contribution to NSGIC as a board member and past president. Bill is a consummate geospatial professional, he is a principled leader, a listener, a giver, a problem-solver and strategist. 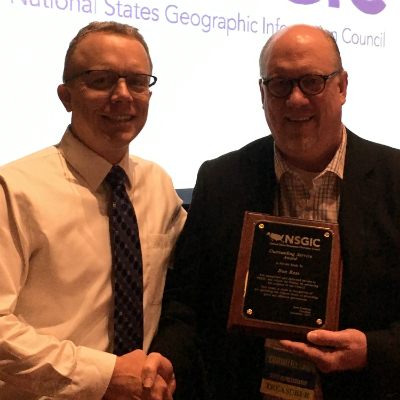 Bill continues to serve in his role as GIS director at USAC, and it is significant that he remains a strong member and participant with NSGIC. 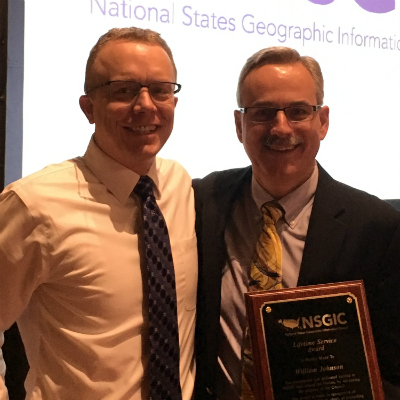 Bill long ago exceeded the lifetime achievement threshold for NSGIC, and we are delighted to see what he'll continue to accomplish next in our field. 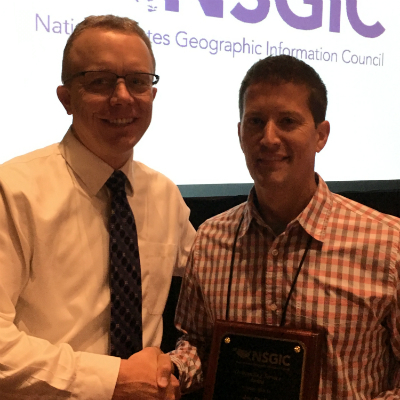 Josh and Jon are recognized for their work in building the participation roster of and quality of content shared at the Geospatial Preparedness Committee meetings and geospatial preparedness sessions at NSGIC conferences. They serve as a great example of how those new to NSGIC can get involved and play a leadership role in the organization early in their membership, and for how NSGIC is stronger when state participation is extended beyond the immediate GIO or GIS coordination office. Susan has now served NSGIC as board secretary and now as a board member. In addition to starting up the GIO office for Georgia, Susan provided critical organization, support, and input in NSGIC's strategic planning retreat prior to our midyear meeting. Karen has diligently served NGSIC is several capacities, as committee chair, as former board member, and as a board officer, serving as secretary. As NSGIC treasurer and finance committee chair, Dan has been a steady, insightful contributor to NSGIC operations and strategy. Dan has also played significant supporting roles in NSGIC's transition to a staff-managed organization including serving on the executive director search committee. He has been the state rep for Minnesota since 2012.